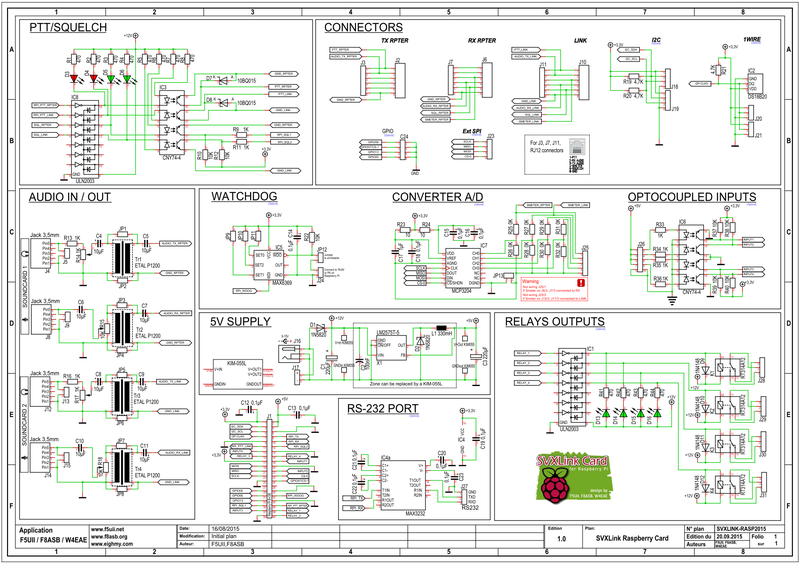 The schematic of the board is available in PDF format. Prin in A3 for best resolution. Connector DC 2,1mm J16 or J17 Screw terminal. J4,J8,J12,J14 Connector jack 3,5mm (It is possible to install PIN to solder J5,J9,J13,J15). It is required to file or grind the 4 rear connections on the SVXLink Card version 1.0. TR1 à TR4 Isolation Transformer ETAL P1200 (There is a possible alternative see above picture). THE ASSEMBLY IS TERMINATED FOR THE MINIMUM VERSION OF THE CARD. NOW WE ARE GOING TO START THE OPTIONAL PARTS. QR:THE CONNECTOR 2 × 20 pins OF THE RASPBERRY PI WILL BE WELD IN THE LAST TIME. IF YOU USE ONLY THE RELAY VERSION WITHOUT LINK, THIS PART MAY BE NOT WELDED. PIN 2×1 Weld the 2 connectors. 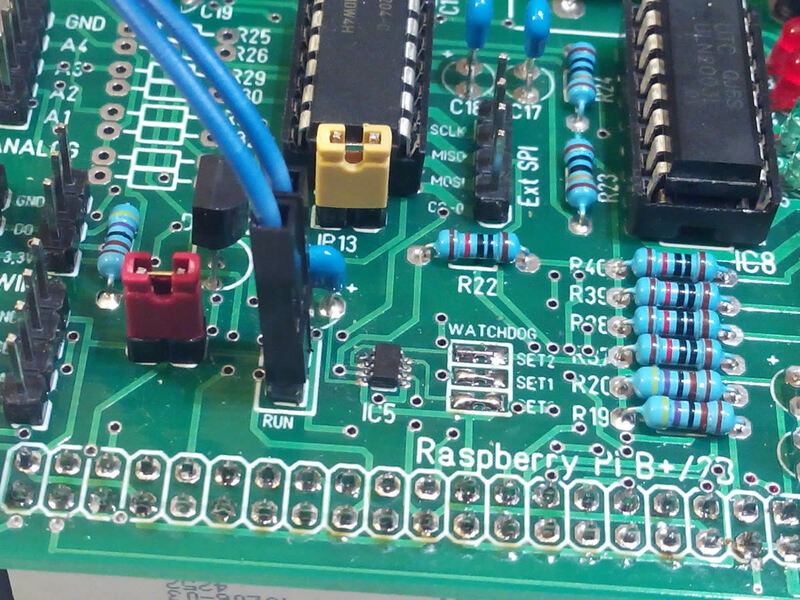 One is useful to activate the Watchdog and the other (RUN) to connect the RUN or P6 connector of release (Reset) of the Raspberry Pi. SET0 SET1 SET2 are jumpers (solder) to determine the time before reset if it does not send a signal. A Watchdog “MAX6369” is a standalone CI. 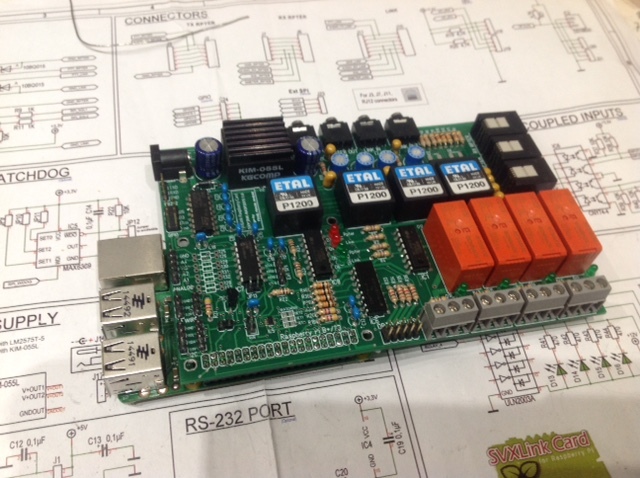 If the component does not receive a voltage pulse (System crash) in a defined period, it will reset the system. As boot starting time exceeds 10 seconds, it is recommended to set the detection time (timeout) at maximum. 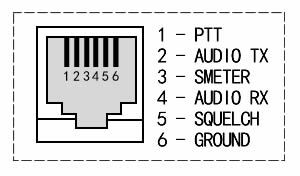 As indicated in the above table, the 3 jumpers SET0, SET1 and SET2 needs to be closed (Weld the three pairs of squares). 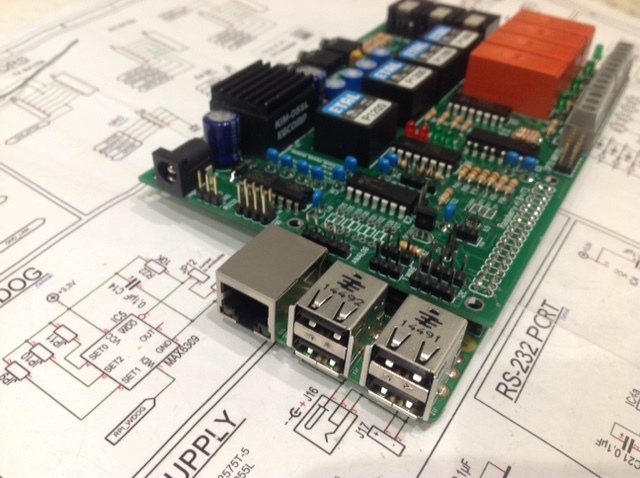 The installation is just prolonging the I2C connections that are on the Raspberry Pi. J20 and J21 Installation 2 connectors pin 3×1, for 1WIRE externals sensors. 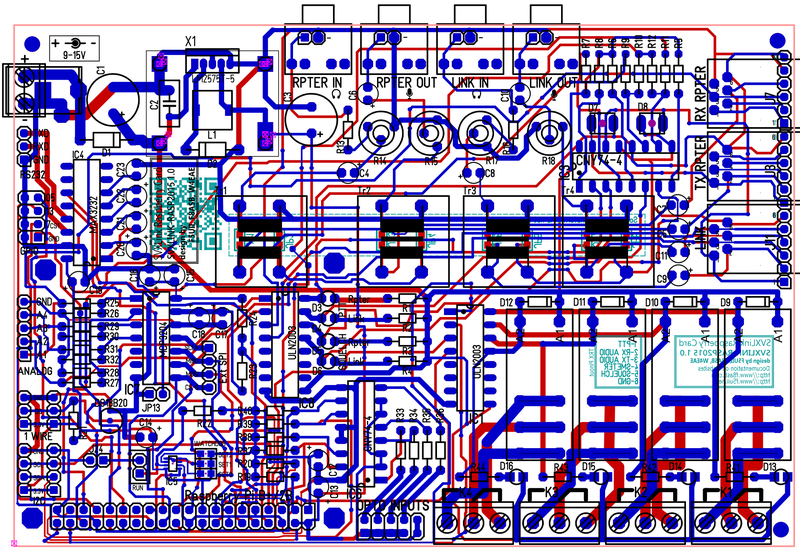 Here an overall picture at this level of assembly. the resistors R25 to R32 (bridge voltage divider), will be determined depending on the voltage to be measured. It remains the connector Pin J25 5×1 and the connector Pin 2×1 for the jumper JP13 used to connect the grounds Card/measures if necessary. Connector PIN 3×1 will be used to connect RXD,TXD,GNG on a DB9 connector for example. The Raspberry Pi is fixed on the card with 4 spacers 10mm and 8 screws M3, this is a temporary assembly because you'll have to add spacers to secure definitively the card in a box.